What may come as a bit of a shock to some not really familiar with Indiana University football is that IU has had it's share of truly great football players and in the early 60's one of these was an All-American from Michigan City, Indiana named Tom Nowatzke. Tom, as a fullback, didn't run around defenders. He didn't run by defenders. He just ran over and through defenders. This 6'3" 228-pound bull of a man started his sophomore season playing behind first team All-American Marv Woodson. Despite being injured part of his first year, Tom would carry the ball 53 times that for 204 yards while catching 4 passes for 32 yards. However the 1963 season brought Tom into the forefront of Indiana football. All-American back Marv Woodson was lost for the season in the third game of the campaign. Nowatzke stepped in to carry the load. Tom rushed for 765 yards for 6 touchdowns. He caught 7 passes for 81 yards and ran back two kickoffs for 24 yards all the while kicking 5 field goals. 7 extra points, and recovered 5 fumbles. The 1964 Indiana media guide said of Tom, "There are those who say Tom is Indiana's greatest player ever. If they're wrong, it's not by much. If he doesn't make All-American in 64 there should be an investigation." In 1963, he led the Big Ten in rushing, the first Indiana player to do this. He would go on to set a Indiana school rushing record with 756 yards for a 4.7 average. He set a new Indiana scoring record with 58 points. Set an Indiana record of 5 field goals in a season. He led Indiana with 4 interceptions for 91 yards including returning one for 52 yards and a touchdown against Oregon. In 1963, he rushed for more then 100 yards 3 times: 138 yards vs Minnesota, 134 yards vs Oregon State, and 124 yards vs Purdue when Nowatzke teamed with quarterback Rich Bader, and wideout Bill Malinchak to become the first Indiana trio to pass, run, and catch for 100 yards each in the same game. For his junior year, Tom earned All-Big Ten honors, as well as, being named Indiana's Most Valuable Player, and Indiana's Balfour award winner in football. During his senior year, he again led Indiana in rushing with 546 yards and 9 touchdowns while catching 16 passes for 172 yards and 1 touchdown again setting an Indiana scoring record of 73 points. He also kicked 10 extra points and became the Big Ten record holder in longest field goal with a 50-yard kick against Ohio State. He was selected All-Big Ten First-Team. He played in the East-West game, the Senior Bowl, and was selected as one of 11 players named to the Coaches All-American team while being named Indiana's Balfour award winner. 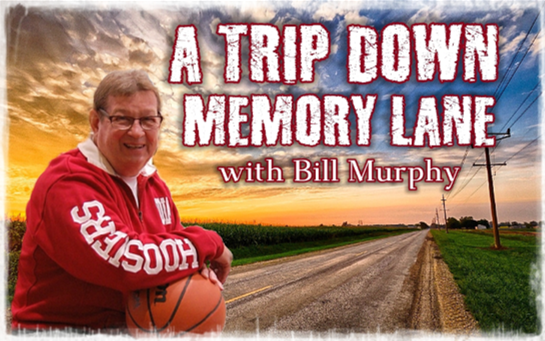 He was the last of Indiana's 60-minute players. 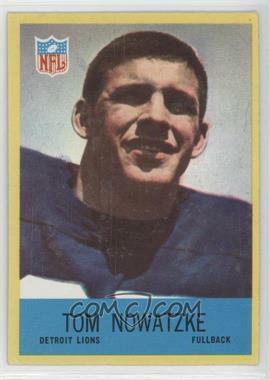 Nowatzke was selected in the first round in the 1965 draft by both the Lions of the NFL (11th overall) and the Jets of the AFL (4th overall). He would go on to play for Detroit from 1965 to 1969. Then, for the Colts from 1970 to 1972. He scored the tying touchdown for the Colts in Super Bowl V in the Colts' victory over the Cowboys. For his career in the NFL, he rushed for 1,249 yards and scored 13 touchdowns. He was inducted into both the Indiana University and National Polish-American Sports Hall of Fame. 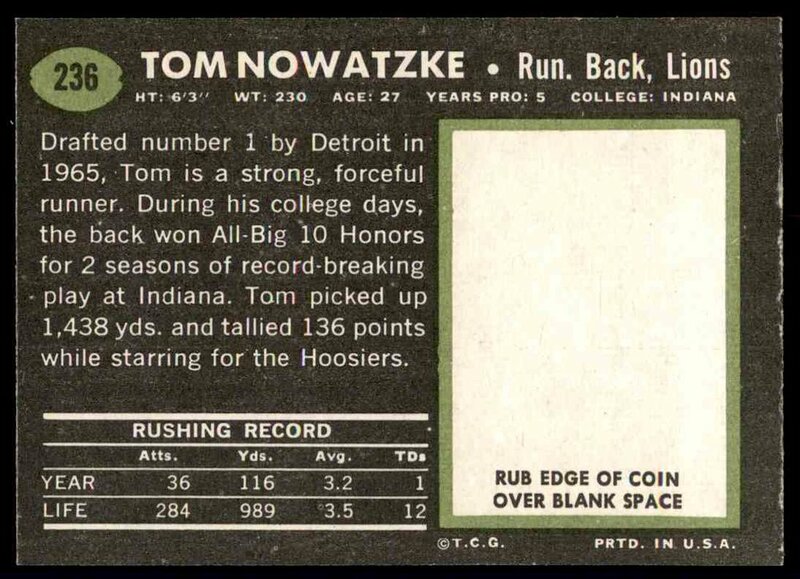 Tom Nowatzke was truly one of Indiana's all-time greats.